New York: Random House, 2004. First Edition. First Printing. good, good. 375, illus. (many in color), diagram, note on sources, index, front board slightly bowed, name whited out on front flyleaf. DJ somewhat worn and soiled, DJ somewhat stained on inside. 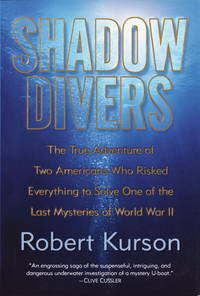 The perilous, obsessive world of the deep-sea diver is revealed in this true account of a six-year quest begun in 1991 to recover items from and discover the identity of a World War II U-boat sunk off the coast of New Jersey, a place where the history books said no such ship should be.